This deluxe beach hotel is located in the well-known Balneario 6, divided from the sandy beach by just a superb palm lined promenade. 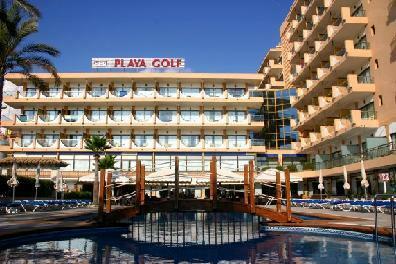 It is just 200 m to the resort's centre, 10 km to the nearest golf course and 13 km to Palma. Public transport leaves from directly in front of the hotel complex.The elegant hotel was built in 1970 and renovated in 2003. It has a total of 222 rooms on 8 and 4 floors respectively. There are 12 suites, 24 single rooms and 186 doubles as well as a considerable garden. The hotel's facilities include a pleasant lobby with a 24-hour reception, a safe, 2 lifts, a café, a bar, a boutique, a TV room, a conference room and a children's playground. Furthermore, the hotel has an air-conditioned restaurant with delightful views out over the sea, a non-smoking area and children's highchairs. In addition, room service and a laundry service are available as well as medical assistance.